Did Marvel Just Spoil Which Infinity Stones Thanos Gets in 'Infinity War'? Marvel might have accidentally spoiled which Infinity Stones Thanos gets in Avengers: Infinity War, or at the very least, the four Stones he gets first. On Thursday, Marvel Studios kicked-off its 10-year anniversary celebration that includes an epic “Class Photo” but also a video detailing a sweepstakes. It could send fans to the Infinity War premiere, the set of Captain Marvel, or deliver all sorts of other behind-the-scenes perks. But one random shot of the Infinity Gauntlet included in the video might tell us a whole lot about what goes down in Infinity War. Potential spoilers follow for Avengers: Infinity War. Just after a shot in the video of Chris Pratt flying around in front of a green screen as Star-Lord, we see the Infinity Gauntlet sitting in a large black case. And all four of the knuckle slots on the glove are filled by Infinity Stones with only two Stones missing. 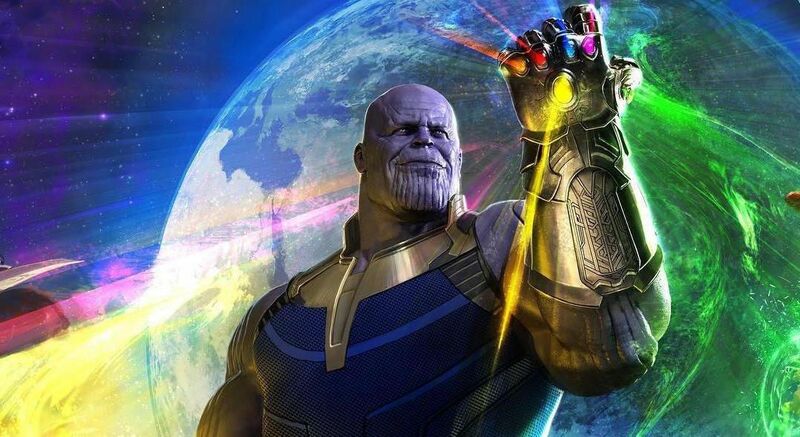 Thanos gets the purple Power Stone first, probably by raiding the Nova Corps vault on Xandar, where it was left at the end of Guardians of the Galaxy vol. 1. We know the Power Stone comes first because we also see Thanos place the blue Space Stone directly into the Gauntlet’s second slot. Assuming this throwaway shot from yesterday’s video is “real,” then that means that Thanos will fill the other two knuckle slots next. The colors are somewhat difficult to distinguish in the video — we’re working with red, orange, and yellow here — but those two slots definitely belong to red and orange, or more accurately, the Reality Stone and Soul Stones. Remember that huge poster featuring most of Infinity War’s many characters? The colors coincide with what we see there. We know from this shot that if Thanos fills up the entire Gauntlet, here's where each Stone will go. And for what it’s worth, that’s the same order that was shown in the replica on display at D23 and San Diego Comic-Con over the summer. We can probably assume, then, that after Thanos gets the Tesseract from Loki, he takes the Reality Stone from the Collector’s Vault. Then he’ll for for the mysterious Soul Stone, the location of which remains unknown. The most popular theory to date is that the Soul Stone is kept in Wakanda, which could be confirmed when Black Panther comes out next week. But that would definitely explain why a huge battle happens there during Infinity War. Thanos probably throws a whole army at Wakanda just so he can get that Stone. They're defending Wakanda here, but they also might be protecting the Soul Stone. For all we know, Infinity War ends with Thanos getting all four of these Stones — but it might not. The Time Stone inside the Eye of Agomotto, kept in Kamar-Taj, will be one of the last that Thanos claims, if at all. Vision will probably be quite happy about this whole theory. The yellow Mind Stone is lodged firmly in his forehead, and it’s seemingly also among the last two that Thanos might claim. But we do get a brief shot in the trailer in which Thano’s lieutenant Corvus Glaive tries to pry the Mind Stone out. Could this assault on Vision be a failed attempt that Vision survives? Or could Vision’s death here be one of the last things we see in Infinity War? For all we know, revealing this throwaway shot of the Infinity Gauntlet prop could just be a calculated case of misdirection. But then again, it might just come to be the truth. We’ll know more when Avengers 4 finally comes out, and maybe more when Black Panther drops next week. Black Panther comes out February 16 and Avengers: Infinity War will be released May 4, 2018.